Just how much trash do you create each day? Estimates put that number at 4 pounds per person each day. Add it up and that comes to 1.5 tons each year. A family of four, then makes over 5 tons of garbage. That’s a lot of garbage for one household. In fact, when you combine everyone’s garbage in the country, it comes out to over 200 million tons or enough to fill an entire football stadium. 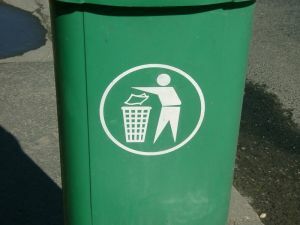 The Environmental Protection Agency has estimated that 75% of all the stuff we generate as trash can be recycled. Sadly, we only recycle about 30% of that. That includes food waste. Collectively we throw out 21.5 million tons of food waste each year. If that were turned into compost, then it would help reduce greenhouse gases. How much? It would be the same as taking 2 million cars off the road. Recycling is related to energy efficiency. The more we recycle, the less energy we expend making new things. For instance, recycling just one soda can saves enough energy to listen to a full album on your Smartphone. Recycle 100 cans and you can light your bedroom for two whole weeks. There is also value in recycling. The 36 billion aluminum cans that ended up in a landfill last year could have been turned into $600 million in cash. We throw out another 28 billion bottles and jars every year. Imagine if you could cash those out. Those same glass jars could end up back on a store shelf in just under a month if they got recycled. If all of these recycling facts are inspiring you to step up your recycling game, then Junk King Dayton is the perfect partner to work with. This is a professional junk hauling company that is dedicated to recycling the bulk of what they collect. You don’t have to decide what could be recycled or donate from your stuff. They Junk King crews have been trained to handle that. Make sure the junk you’re getting rid of is recycled with help from Junk King Dayton. This entry was posted in Dayton Junk Recycling, Dayton Junk Removal and tagged Junk King, Junk removal, recycling on November 26, 2017 by Junk King. Last updated November 26, 2017 .